The Nelson and David Rockefeller Chair in Latin America Studies honors two distinguished Americans who have been influential in the development of U.S. policy in the Western Hemisphere during the past half-century. The Rockefeller chair helps to provide the best possible analysis of current developments in Latin America and creates forums for the rational discussion of policy options. David Rockefeller was a member of the Council on Foreign Relations from 1941 until his death in 2017 at the age of 101. He served as chairman of the Board of Directors from 1970 to 1985, after which he became honorary chairman. He graduated from Harvard College in 1936, and pursued graduate studies at Harvard, the London School of Economics, and the University of Chicago, where he received his doctorate in 1940. Rockefeller worked as secretary for New York City’s mayor Fiorello LaGuardia in 1940 and 1941, and enlisted in the U.S. Army as a private in 1942. After attending officer candidate school, he served as an intelligence officer in North Africa and Southern France and as an assistant military attaché at the U.S. Embassy in Paris. He was honorably discharged in November 1945. Rockefeller began his career with Chase National Bank in 1946. He became president and co-chief executive officer (CEO) of the newly created Chase Manhattan bank in 1960. He became chairman and CEO in 1969 and, under his leadership, the bank dramatically expanded its international operations. He retired in 1981. Rockefeller served in leadership positions at a number of Rockefeller organizations, including as chairman of the Rockefeller Group, Inc. from 1981 to 1995, chairman of Rockefeller Center Properties, Inc. Trust from 1996 to 2000, a trustee of the Rockefeller Brothers Fund beginning in 1940, and chairman from 1981 to 1987. Rockefeller was also instrumental in the creation of several other organizations, including the International Executive Service Corps, the Trilateral Commission, the Partnership for New York City, and the Americas Society/Council of the Americas. He served as chairman of the Rockefeller University for many years and then honorary chairman, life trustee, and chairman emeritus of the Rockefeller University Council. He was the former chairman of the Museum of Modern Art and also served as chairman emeritus and life trustee. Nelson A. Rockefeller was a businessman, politician, statesman, art collector, and philanthropist. He began his public life as an officer in a number of family-related enterprises, including Rockefeller Center, Creole Oil (the Venezuelan subsidiary of Standard Oil), and the Museum of Modern Art, but he soon began to establish new organizations to fulfill his personal interests. In 1940, Rockefeller and his siblings founded their own philanthropic foundation, the Rockefeller Brothers Fund. Rockefeller also established the American International Association for Economic Development in 1946 and the International Basic Economy Corporation in 1947, both of which focused on Latin America. In 1954, he established the Museum of Primitive Art in New York City. Rockefeller's service in government began in 1933 as a member of the Westchester County Board of Health; he moved onto the national and international scene in 1940 as the coordinator of the Office of Inter-American Affairs under President Franklin D. Roosevelt. He was the first assistant secretary for Latin American affairs and in that capacity played a significant role in the creation of the United Nations in 1946. Rockefeller received subsequent presidential appointments from Presidents Harry Truman, Dwight D. Eisenhower, and Richard M. Nixon, working on government reorganization, public policy, and foreign affairs. In the 1950s and 1960s Rockefeller sought elective office himself. 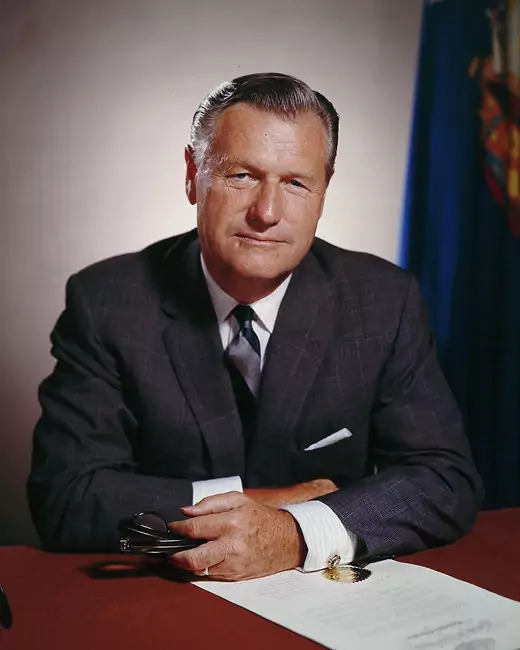 Beginning in 1958, he won election to four consecutive terms as governor of New York State, where, as a progressive Republican, he vastly increased the state's role in education, environmental protection, transportation, housing, welfare, and the arts. His candidacies for the Republican nomination for president in 1960, 1964, and 1968 were not successful. He resigned as governor in 1973 and the next year was nominated as vice president of the United States, serving under President Gerald Ford (1974–1977).